Pay just £20 at the start of each month by standing order and when visiting our salon for your 1st treatment that month you will receive a £20 deduction due to paying this at the start of the month. Furthermore you will receive our star members prices for all treatments during the month and have exclusive offers and discounts by email or text message. 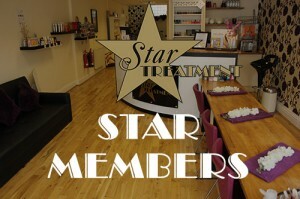 Call our salon today for more information on becoming a star member, you have nothing to lose!